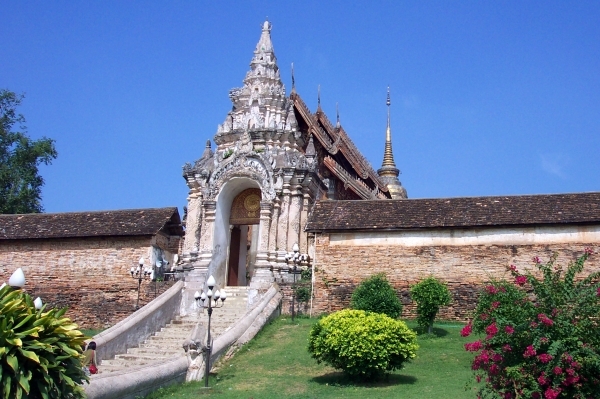 About 20 kilometers from Lampang is the old temple of Wat Phra That Lampang Luang. On first glance, this walled citadel sited on a man-made mound of earth has a very fortress-like look to it. That's because the temple was built on the site of an eighth century fortification, called a wiang, that guarded the routes to Lampang. The temple buildings seen today were built in the fifteenth century, and one of the reasons for the temple's popularity is the relatively pure state of all the temple buildings. Unlike most of the temples in Chiang Mai, Wat Phra That Lampang Luang hasn't been 'improved' to conform to modern Thai ideas about temples. The courtyard is still filled with sand, and the huge main wiharn (prayer hall) is still open on all sides. To enter the temple, you must pass a pair of guardian lions and climb the naga stairway up to the massive main gate. 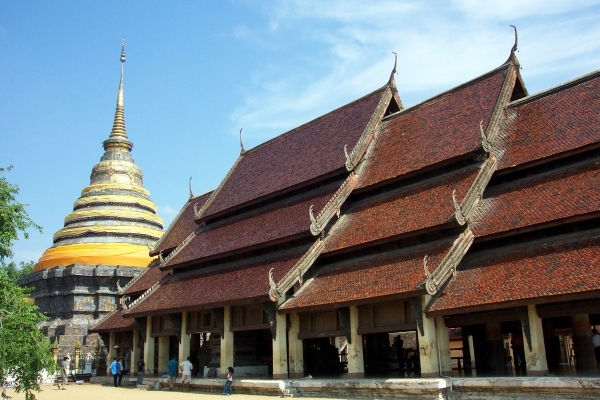 The main prayer hall, the Wiharn Luang, stands close inside the main entrance. The chapel is open on all four sides, forming a huge covered hall. Sturdy columns support the roof. The columns are finished in black lacquer and stenciled with gold leaf designs. 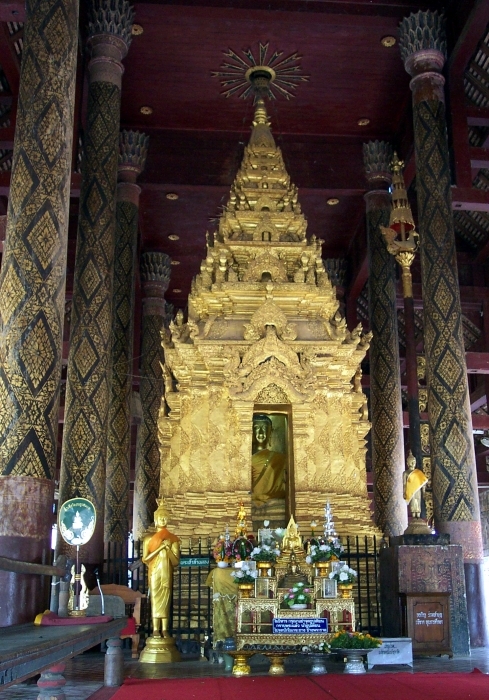 At the back of the Wiharn Luang sits a massive gilded ku, a sort of Laotian pagoda sheltering the main Buddha image. The Buddha image is the Phra Chao Lang Thong, cast in 1563. On either side of the Ku are throne-like pulpits, sometimes used by monks but more often used to house other Buddha images on important ceremonial days. Behind the main prayer hall stands the 45 meter tall chedi (pagoda). The pagoda was faced with copper and bronze sheets, which over the centuries have oxidized into a variety of green and blue shades. The chedi has somehow escaped the gilding which is now universally applied to pagodas in Thailand, even if they weren't originally built that way. Flanking the chedi on the south side is another prayer hall, the Wiharn Phra Phut, a small chapel built in 1802 with a beautifully carved facade. Behind the Wiharn Phar Phut is a tiny tower-like structure, the Ho Phra Phuttabat. It houses a Buddha footprint sculpture. The building is generally only open on important festival dates, and may never be entered by women. On the other side of the pagoda and the main wihard are two other small open chapels. Although very weathered, both have some rather interesting details and murals. A doorway on the south side of the gallery leads you to several other buildings, as well as the temple's museum. On the way, you'll pass an ancient bodhi tree whose branches are supported by a forest of crutches. The two museums are not very interesting, even though one houses the Phra Kaeo Don Tao, a supposed 'copy' of the Emerald Buddha and made at the same time. But it lacks most of the subtlety of the Emerald Buddha, and the setting doesn't do it justice. For a close-up look at the Emerald Buddha, you're better advised to visit Wat Phra Kaeo in Chiang Rai, where they have a recently made copy in a beautiful setting. However, there is a beautiful 400 year old scripture library in amongst the museums that is worth a look.